Thank you so much, this was extremely helpful to me!!! I used this to install a Samsung m2830 and it worked perfectly. I was having issue with rastertospl. First as a missing file and than when I had copied it manually, I had permissions issues. Changing permissions on the file itself did not fix the problem. THIS worked tho, so thank you again!! Great, this really works. Thank you so much. Thanks for the explanation. It workt for me after a long time not be able to print with linux mint. Thank you very much!!!! 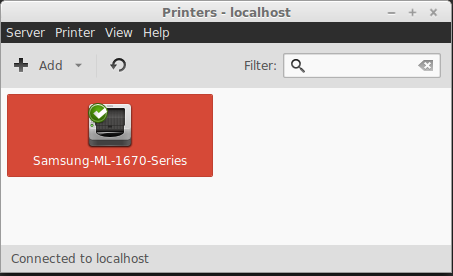 I had the problem with rastertosplc file and now my printer work in Ubuntu. This is what I get when i tried to do this in Ubuntu 15.4 ??? The Samsung driver-link mentioned on this website is not available anymore. My ML1675 worked fine till Linux Mint 17.3. It did not work anymore with Mint 18 and 19. I tried the old Samsung Unified Linux Driver I used on Mint 17 and the last Samsung ULD before Samsung handed the distribution of Samsung drivers over to HP. Unfortunately HP does not provide drivers for the ML1675! What can I do now?